New York: Dubbed the “Largest Black Parade in America,” thousands came out for the 47th Annual African-American Day Parade on Sunday in Harlem. 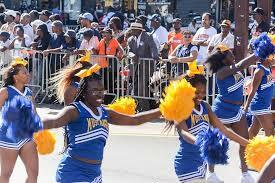 The parade started at West 111th Street and Adam Clayton Powell Jr. Boulevard and proceeded to West 136th Street. Black dignitaries and celebrities along with kings and queens of Black organizations were featured Floats and marching bands came from 12 states including the Howard University Showtime Marching Band. This year’s parade honored the African-American educators.